Extreme adaptations of species usually cause such considerable changes that their evolutionary history is difficult to recreate. Zoologists at the University of Basel in Switzerland have now uncovered a new parasite species that represents the missing link between fungi and an extreme group of parasites. Researchers now have the information to understand for the first time the evolution of these parasites, which cause disease in humans and animals. The study has been published in the latest issue of the scientific journal Proceedings of the National Academy of Sciences (PNAS). Parasites use their hosts to simplify their own lives. To do this, they evolved features that are so extreme that it is often impossible to compare them to other species. The evolution of these extreme adaptations is often too difficult to reconstruct. The research group lead by Prof. Dieter Ebert from the Department of Environmental Science at the University of Basel has now found the missing link that explains how this large group of extreme parasites, the microsporidia, has evolved. Scientists from Sweden and the U.S supported the team in their work. Microsporidia are a large group of extreme parasites that occupy humans and animals and create substantial damage for health care systems and agriculture; there are over 1,200 known species. They live inside their host’s cells and have highly specialised features, including: They are only able to reproduce inside the host’s cells, they have the smallest known genome of all organisms containing a cell nucleus (eukaryotes) and they don’t posses any mitochondria of their own (the cell’s power plant). Along with all this, they developed a specialised infection apparatus, the polar tube, which they use to insert themselves into the cells of their host. As a result of their phenomenal high molecular evolution rate, genome analysis has thus far been rather unsuccessful: their great genomic divergence from all other known organisms further complicates the study of their evolutionary lineage. The team of zoologists lead by Prof. Dieter Ebert has been studying the evolution of microsporidia for a number of years. When they discovered a new parasite in water fleas a couple of years ago, they classified this undescribed species as a microsporidium, as it possessed the unique harpoon-like infection apparatus (the polar-tube), one of the classifying features of microsporidia. The analysis of the entire genome contained several surprises: The genome resembles more that of a fungi than a microsporidium and, in addition, also contains a mitochondrial genome. The new species, now named Mitosporidium daphniae, therefore represents the missing link between fungi and microsporidia. With the help of scientists in Sweden and the U.S., the Basel researchers rewrote the evolutionary history of microsporidia. Firstly, they demonstrated that the new species derives from the ancestors of all known microsporidians and further, that the microsporidians are derivative from the most ancient fungi; there its exact place in the tree of life has finally been discovered. Further research has confirmed that the species does in fact have a microsporidic, intracellular and parasitic lifestyle, but that its genome is rather atypical for a microsporidium. It resembles much more the genome of their fungal ancestors. 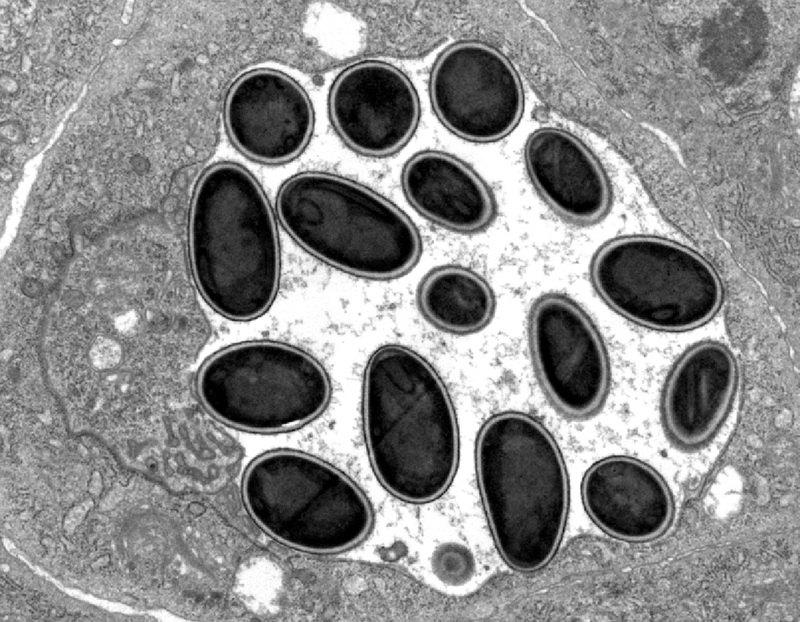 The scientists came to the conclusion that the microsporidia adopted intracellular parasitism first and later altered their genome significantly. These genetic adaptations include the loss of mitochondria, as well as extreme metabolic and genomic simplification. “Our results are not only a milestone for the research on microsporidia, but they are also of great interest to the study of parasitic-specific adaptations in evolution in general”, explains Ebert.